I printed off some writing steps that I found on a homeschool blog. I wish I remembered which one. I love these steps, so I decided to laminate them. Once they were protected, I taped them to the dining room window. Since we don’t have a dedicated school room, we do some work at the kitchen table. 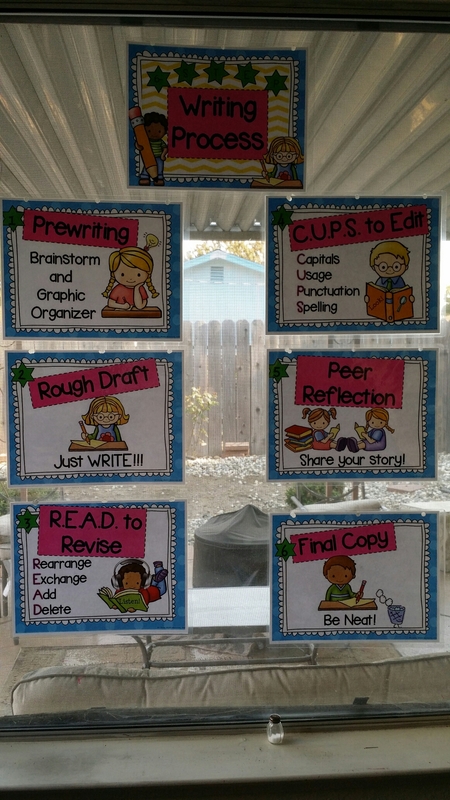 Since my daughter will have writing assignments this year, I wanted to have the steps available for her to use when she is completing assignments. It’s little things like this, that individualizes our school. We get to choose how we decorate our “class”. We purchased our home three years ago, this month. Wow, time sure does fly. Before we moved in, we did some renovations to give it the look we wanted. We didn’t have the money to purchase a la rger home and we downsized considerably when we moved. That being said, we’re slowly but surely updating the house. Our latest renovation, the stairs and the upstairs landing/hallway. I can’t even separate the two because it’s not very big and not sure it’s long enough to earn the title, “hallway”. After three years of puppy fostering, rescuing a dog, and taking in a puppy last year, the upstairs carpet was a bit worse for the wear. We chose to pull it up and add laminate wood flooring. I will say, part of what set this particular wheel in motion was our latest puppy eating part of the carpet on the second step. What can I say puppies teeth and husband’s need to listen to their wives and watch said puppy when she isn’t home. We met Alex, the manager of a local small business, at a home and garden show. We mostly go to “window shop” and get ideas we add to our “I’d love to do this to the house if we had money” list. Little did we know, a few short months later, we’d have our stairs completely redone. We were able to get a Saturday appointment, which really helped, as I had to be home to manage the dogs. We have a German Shepherd mix and a pocket pit bull mix. Honestly, my shepherd mix is the issue. He embraces his K-9 heritage and does not care for people in his home. He’s gotten better since we first rescued him, but he still requires being leashed and by my side when we have workers, etc. in the house. The pit, despite poor media exploitation, is a sweetie. A whiney, hold me, pay attention to me, sweetie. They both did remarkably well, considering the workers were here almost 10 hours. Considering, all they need to do is attach the baseboards and a bit of touch-up work, they are done. They will be back in a few days to finish and then we’ll be 100% done with this home improvement. When all is said and done, I’m very happy about this decision. Not sure if I’m happier with the look or that I will never again have to vacuum the stairs again!